It was recently announced that RSHP’s mixed-use development was chosen as one of the RIBA London winners 2018. Riverlight, a residential-led mixed use development, has transformed the triangular, five-acre industrial estate – close to Battersea Power Station on the south bank of the River Thames –creating a transition between the large footprints of the power station and the smaller residential developments to the east. The development is made up of six buildings, arranged in a rising-form composition, ranging in height from 12 to 20 storeys and giving the development a varied skyline. It includes 806 homes, underground parking, crèche, restaurants, bars, a food store and other retail spaces. The scheme incorporates a river walk and landscaping to take full advantage of its location and create attractive public spaces for the local community. 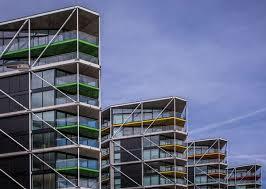 RIBA said of the wining project “Aptly named, this series of dense housing fingers responds to its impressive site by cleverly manipulating its mass and circulation to offer daylight and views of the river to all of its residents. The bold diagram and structural system also offers generous public realm to all those that ambulate along the Thames… In its part, it offers bright sunlit space for all, both externally and internally and in its effortless construction it offers beautiful reflection, a lightness of touch and vibrant colour to this important transition site on the edge of the Battersea Power Station regeneration. CareyGlass are delighted to have supplied 3 Riverlight Quay.